There are 600 CNSMD students enrolled in all the different courses: music students, dancers, trainee dance teachers following the Formation Diplômante de Certificat d’Aptitude à la Danse (FDCAD) course and trainee music teachers following the Formation Diplômante de Certificat d’Aptitude à la Musique (FDCAM) course. 21 students following the dance teacher-training course. The number of applications for admission received was 1016 all told. Of these, 186 candidates were admitted. There are 44 main subjects taught, to which admission is by audition, 70 subsidiary subjects, and a « Laboratoire Scène/recherchE ». The teaching staff, made up of 188 people, is divided into three categories: teachers, assistants and accompanists. 62 master-class and seminaries have taken place in the institution. 31 students participated in student exchanges, either by going abroad at a partner institution or by coming to study at the Lyon CNSMD. 16 teachers took part in teacher exchanges: some CNSMD teachers went abroad to teach in our partner institutions and some teachers from our partner institutions came to give classes at the Lyon CNSMD. There are 67 administrative staff. The public season consists of about 350 events per year, 40% of which take place outside the conservatory. Admission to most events is free. The Lyon CNSMD enjoys the support of more than fifty partners for the season of public events. 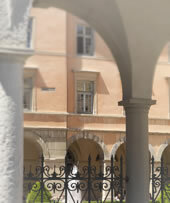 Discussions are held with a view to setting up a second French national conservatory, in Lyon. Launch of plans for the rehabilitation of the former veterinary school at 3 quai Chauveau in the ninth district of Lyon and construction of a new building by architects from Espace Construit. Death of Pierre Cochereau and nomination of Gilbert Amy. Opening of the dance department. First stone of the new conservatory is laid by Jack Lang, Minister of Culture and Communication. Inauguration of the new premises by Raymond Barre, Parliamentary Deputy for the Rhône department, François Léotard, Minister of Culture and Communication, Francisque Collomb, Lord Mayor of Lyon and Gilbert Amy, Director. Inauguration of the new premises of the Dance Department in the Grenier de l’Abondance. Nomination of Henry Fourès as Director of the CNSMD. Nomination of a new director: Géry Moutier. Finalisation of the new Bologna Process course structure with the opening of a doctorate programme in Research and Practice in partnership with the 3LA doctoral school.